May | 2012 | Cool. The 2002 West Finals, Game 5: Mike Bibby Wins the Game! Game 5 is a memorable one, not just because of the tight game, but because of my experience of watching it. I can still vividly remember the sequence of events that day. It was a rainy weekday. My mom and my brother were out. I think mom brought my brother to his taekwondo classes. I was alone. The game, as was the previous game, was tightly contested. Sacramento was trailing the Lakers by one point 91-90, with 11.4 seconds left to play. The Kings had possession. The rain outside was strong and it was dark. Soon, a lightning struck, and the rumble of the thunder followed. As play was about to resume, lightning struck — a figurative one: the electricity went out. Just as the ball was about to be inbounded. The final 11.4 seconds are the ones I would miss. As if to add insult to injury, the electricity came back on less than 10 minutes later. As soon as I heard the sound of the electric fan, I hurriedly got the remote and turned on the TV. I can’t believe what I saw. It was the banner showing “All rights reserved…”. The game just ended. I had to wait till SportsCenter came on hours later to see the highlights of the game. 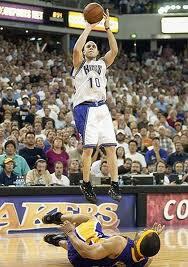 The only shot of the game which I didn’t get to see: Mike Bibby’s game-winner. It was only those precious 11.4 seconds that I missed, and that is a number which has a significant sentimental meaning to me now. Every time I see or hear 11.4, images of Mike Bibby curling around Chris Webber’s screen on the right wing, escaping Derek Fisher, then rising up for this jumpshot, come to mind. Kobe Bryant, with the Lakers trailing the Kings 99-97, drove to the basket trying to draw the foul. No whistle, layup missed. About five seconds remained in the game. The logical thing to do for the Kings, if they can’t grab the rebound, is to tap the ball out as far from the basket as possible. 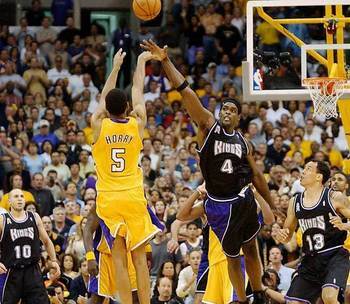 Sadly, it went to the hands of Big Shot Rob, Robert Horry. Three-pointer from the top of the key, bullseye! Buzzer sounds. The red light goes on. Lakers win 100-99 with a shot that lives on as one of the greatest in NBA playoff history. Horry’s celebration was simple: hands down, bouncing up and down while his teammates parade themselves around him, hugging him, thanking him for sending the series to a pivotal Game 5 with the series tied at 2 instead of being down 3-1. Somewhere in Los Angeles, Katy Perry is dedicating one of her hit songs to the Los Angeles Lakers: The One That Got Away. Game 2 of their best of seven Western Conference semifinal series against the Oklahoma City Thunder was right in the Lakers’ hands. They were presented with all opportunities to tie the series at one game apiece. But did they capitalize? No, they let it slip away from them. It was a 75-68 game in favor of the boys from Long Beach with 2:08 left in the game. The way OKC played the whole second half, I thought they were definitely done for the game. The Lakers were rolling, Kobe was hitting his Kobe shots, and the Thunder just can’t make any. All signs pointed towards a Game 3 in LA with the series tied at 1. That’s when the Thunder started rumbling. Sixth man of the year James Harden ignited Oklahoma City with a hard drive to the basket for a layup. On the Lakers’ next possession, Durant came up with the steal for a fastbreak dunk. Their next two possessions ended with a turnover and a blocked shot, respectively. Another score by Harden and all of a sudden, it was just a one-point LA lead with less than a minute to go. Kevin Durant receives the ball on top of the arc from Russell Westbrook with 26 seconds left. Metta World Peace, probably the Lakers’ best defender, was guarding him. Kendrick Perkins sets a screen on World Peace, giving Durant space to drive to his right. He attacks the basket, easily going by Andrew Bynum. He was now driving at the right baseline, with the last line of the LA defense being Pau Gasol. Durant lobs up a floater, Pau challenges him. A roll, a bounce, swish. And the crowd erupts. Durantula stings the Lakers. It was now 76-75 for Oklahoma City. 18.6 seconds left. For 13 seconds the Lakers held the ball on their next possesion before Thabo Sefolosha committed a foul to give on Kobe. Perfect timing on the foul too, as he committed it with time winding down, and with Kobe on his way to the basket. But there was still 5.7 ticks on the clock. The game isn’t over yet, not with Kobe in it. World Peace was set to inbound the ball. Steve Blake, guarded by Westbrook, rushed to the near corner. Westbrook, as Reggie Miller said in the broadcast, was caught sleeping in the play. He did not go after Blake, instead giving up a wide, wide open three pointer. The Lakers, once again, let the win get away. You can’t miss wide open threes in the Playoffs, especially in close games. And most especially if that shot spells the difference between winning and losing. And the difference between going back to Staples Center tied at 1 or down 2-0. Had that shot gone in, though, everything will be pinned on Russell Westbrook. And it won’t be surprising if the Lakers play ‘The One That Got Away’ on the PA system to introduce Westbrook. This series looks bleak for the Lakers. Games 3 and 4 will be on back-to-back days. Seven games for Denver, a right-down-to-the-wire Game 2. The Lakers are tired. This series might get away from them, and I wouldn’t be surprised at all if it does. I won’t keep you reading for long and I’ll quickly get to my point: this year’s NBA champion will come from the West, and no, it won’t be the LA Clippers. The East is predictable. It will either be the Miami Heat or the Boston Celtics. Indiana? They lack a premier go-to scorer that the Heat have in Lebron and Dwyane Wade. The 76ers? Too young for the battle-tested Boston squad. Miami should have its way against Indiana. The way Lebron ransacked the Pacer defense with 32 points while also grabbing 15 rebounds with 6 of those coming on the offensive side, it’s hard to spot anyone in the opposition capable of stopping him. He’s big, he’s fast, he’s quick, and he can score that basketball so well. Boston core lineup of Rajon Rondo, Ray Allen, Paul Pierce, and Kevin Garnett have been together for the past 5 seasons, reaching the Finals twice and winning one title along the way. Too much experience and skill. The all-around Rondo can pick the Sixers apart. His ability to run the offense and to defend well will be too much for Philly to handle. Out West, the Clippers can’t pull this one off, I’m sorry to say. The way they played against Memphis was admirably ugly — being scrappy and rugged — and definitely far from pretty. I’m not saying “pretty” wins games, but against San Antonio, against Tim Duncan and Gregg Popovich, you can’t play ugly. Turnovers must be kept to a minimum because that Spurs team takes very good care of the basketball: they averaged just a little over 11 per game against Utah. Plus, LA is far too inconsistent, especially at the free throw line. Blake Griffin is hurt, as well as Chris Paul. They can’t win a 7-game series, especially against San Antonio, without those two being effective. The other West matchup is a battle. Kobe versus Durant. World Peace versus Harden. Derek Fisher versus his old team. Bynum’s shot-blocking versus Ibaka’s shot-blocking. Tough call here. Both teams are very evenly match. But I have a feeling Derek Fisher may be to the Thunder what Don Nelson was to the Warriors in 2007. I can’t wait to get this match-up going. It’s the West’s year this year. Take your pick. Spurs, Lakers, or Thunder. Barring any injuries, it’s going to be either Tony Parker, Kobe Bryant, or Kevin Durant who will be hoisting that Larry O’Brien trophy up in June.